Backyard family BBQs are one of my favourite things about summer. I love to entertain friends and family with lots of good food and lively conversation. The weather is finally nice (no more snow!) and I’m in the mood to hang out with the people I love the most. I’ve always enjoyed outdoor entertaining and I can’t wait to plan our first party of the season. Planning the perfect backyard BBQ isn’t that difficult. I think they are one of the easiest types of parties to throw. You don’t have to worry about your home being immaculate (besides the bathroom) so it’s less work to put together on your end. I have some simple tips to help you throw the perfect backyard BBQ and make it an unforgettable day or evening. 1. Make sure your BBQ is clean and working properly. There is nothing worse than to have all your food ready to go and find out your BBQ, the star of the show, is out of commission. Now is a great time to upgrade to a new BBQ if your old one has seen better days. I’m loving this Napoleon Prestige 29,000 BTU Fullsize Natural Gas BBQ from Best Buy Canada. It has a porcelainized WAVE reversible cooking channel grids and is big enough to grill 20 burgers at the same time. It has 308 square inches of cooking surface so you can host a large party that will allow everyone to eat at the same time. If you prefer a propane grill, I recommend the Napoleon Freestyle 14,000 BTU Portable Propane BBQ. You can bring it anywhere which is great for camping. It also has an ample cooking surface with 215 square inches – enough to grill up to 15 four-inch burgers. 2. Ensure your guests have somewhere comfortable to sit outside. I like to call these areas conversation spots where people can sit and chat together. Outdoor furniture is perfect for this purpose and Best Buy Canada has loads of selection for you to choose from like this Tropea 6-Piece Patio Conversation Set and Tropea 7-Piece Conversation Set. They are comfy, cozy and will look fabulous on your deck or patio. 3. Clean off your dining set so guests have somewhere to eat. A dining set is a must at your backyard BBQ. Your guests need to have somewhere to eat! If you are looking to freshen up your patio or deck, check out this Elba 7-Piece Wicker Patio Dining Set or Tropea 7-Piece Patio Dining Set. Both are perfect for outdoor entertaining in comfort and style. 4. Offer a shady spot especially if your party is hosted during the day. Your guests will want to have an area to get out of the direct sunlight, but still be outside to enjoy the nice weather. Pick up a Tropea 9 ft. Collapsible Cantilever Umbrella to add some shade to your outdoor oasis. It has an olefin canopy with UV inhibitors and also a water-resistant coating. 5. Serve a delicious menu with all the fixins’. I typically stick to simple fare like burgers or hot dogs, pasta or potato salad and grilled veggies. Prep as much as you can the night before and store it in the fridge so it’s ready to go the next day when your guests arrive. 6. Set out a drinks station. Put out a cooler filled with ice cold drinks that you guests can grab throughout the party. Make sure to keep an eye on it though since you will probably have to refill it a few times before the party is over. 7. Don’t forget the finishing touches to add ambiance to your oasis. Think music, patio lights, plants or flowers for extra decor, place mats & cutlery and citronella candles to keep the bugs at bay. These little extras make a big difference! 8. Set out some fun backyard games for guests to play. We love karaoke and horseshoes! Some other ideas include trivia games, badminton and lawn darts. 9. Buy some paper plates to send guests home with the leftovers. I never let my guests leave my house empty handed! It’s also a great way to ensure you don’t end up with a fridge full of extra food that will go to waste. For more outdoor entertaining products, make sure you check out the other products featured in the Best Buy Outdoor sale currently running until June 2, 2017. Now is the perfect time to get your outdoor space ready for entertaining and then you can relax and enjoy all that summer has to offer. Do you have any other tips to add? You might also like these free party planning printables. Connect with Best Buy Canada on Facebook and Twitter. Disclosure: I was compensated for this post. All opinions are my own. 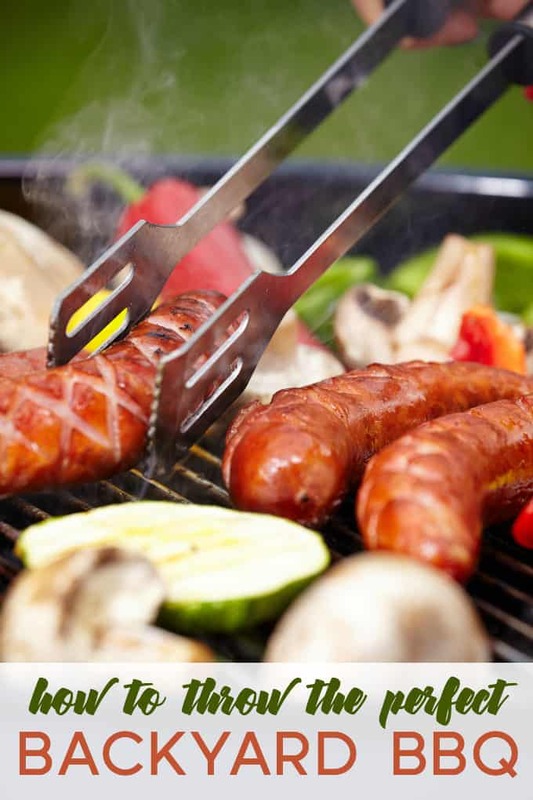 We love to bbq in the warmer months and have bbq for Birthday parties. I like getting the family together and making good food and spending the day together! Backyard BBQ’s are the best,thanks for the tips! Shade is super important. No one will enjoy themselves if they have to bake in the sun all day and I want people to have fun when they come over to my house. I love doing barbecues! One of my favorite ways to eat is off the grill and I love when people are over to enjoy it with us. These are some great tips really use a few of these next time. This is a great guide. We love to barbecue as often as possible during the warm months. Everything you listed here is a must-have. I love this checklist it is a backyard barbecue 101. I am not the cook or entertainer you are but I will use your ideas to make my own party. We haven’t had a backyard BBQ in a long time. I would love to have one. I will utilize these tips whenever we do. There is nothing my family loves more than a good ole BBQ!!!! Those brats in that photo look amazing! I would add buy lots of bagged ice. Trying to manage ice cube trays for parties is miserable. Snow cones, drinks, chilling things quickly, keeping food cold, all require ice. You can never have too much ice at a barbecue. We don’t have many good options for shade right now. That’s something I need to work on. We do have a few lawn games we bring out though! Those are all great suggestions. For almost any celebration I recommend using as many disposable things as possible, to help cut down on dishes to wash and even breakage. Those are great tips! I agree with a drink station, it can be so hot out especially over the summer. I will have to try these great tips this weekend. We are planning a big BBQ int he back yard. I am hoping we do not get more rain. I can’t wait to host a BBQ this summer. I enjoy the delicious food in particular! I’m going to keep your tips in mind though so we can have an even better party this year. I enjoy entertaining in the summer when the weather is nice. These are all great tips. I’ll have to check out what Best Buy has to offer. I love these tips! I enjoy hosting outdoor parties and BBQ! I’ll definitely try these tips for our summer get together! These are really great tips. I can’t wait to have a family BBQ this summer. Yes, it’s BBQ time. Except for the snow we had on Thursday…. These are great tips. For games we do corn hole, horse shoes and we have some card games as well. Great tips, I love bbq. I have a big party/BBQ every year and I can definitely use some of your tips and advice.